When a donor contributes to your campaign their credit card statement will have a description for the transaction. By default this is set to NIL. The title that appears alongside a transaction date and transaction amount is the statement descriptor. We strongly recommend you set a custom statement descriptor so your donors fully understand the origins of the transaction on their credit card statement. Below is a quick guide on how to setup your statement descriptor in your Stripe account. Goto: "Your account" "Account Settings". Click on the "Public Info" button beside the blue "Account Info" button. 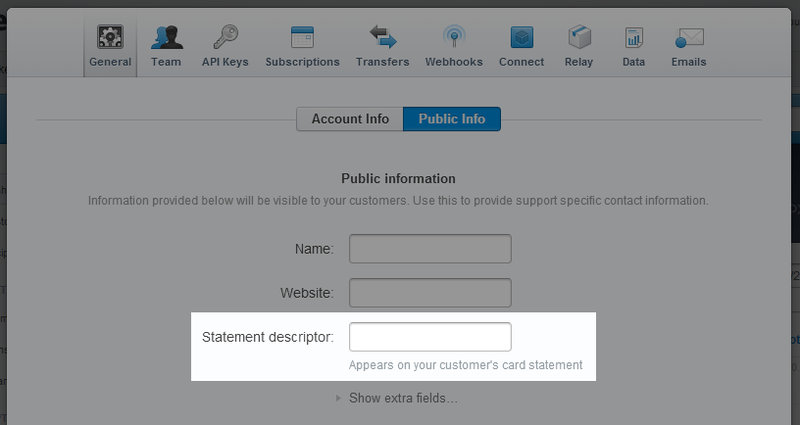 In the "Statement descriptor" box input your desired transaction description. It is recommended that you set a description that can help donors identify your organization.